Yes, Heathkit made a Logic Analyzer, which had software that is now unavailable. Except that I have an original copy of that software and am now making it available for free! I bought and built one of their analyzers (still have it). Works pretty well for what it is. So make me feel good and Email a thank you when you have time. Makes it worth doing all of this. Please do not resell the files I post here. This is the Desciption Page for the logicA.zip file, which can be downloaded from the main sonic page. I wanted to thank you for providing the Logic Analyzer Software. As a point of interest, it took me a long time to find your site since I was searching for the Heathkit IC-1001 software, which is the Logic Analyzer model for which the logicA.zip file is intended. I think it would be useful to include the model number in your webpage so that others searching for this file will be able to find it easier. I have provided the version of the software that came with the IC-1001 Analyzer I have. I appears to be the same with the exception that there is a read.me file included for additional program help (and it is humorous by today's standards). A big thank you to Chris for the above Emailed information. I hope to make sure the available download has all the mentioned files included. 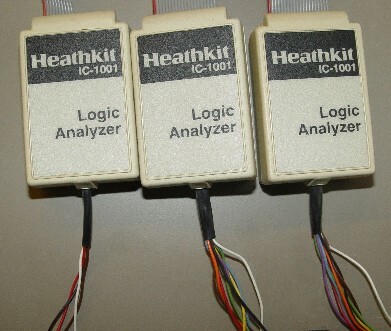 Have fun with your Heathkit Logic Analyzer! Also a big thank you to Ken kb7rgg for the nice pictures from his test equipment web site. You might search it out if you want to view some nice vintage test equipment.